Haze is in. Once perceived as a flaw, ultra-cloudy IPAs are taking the nation by storm. With a catchy name and a dedication to the craft, one Missoula, Montana brewery is turning them into a signature line of beers on par with the finest in the country. Say hello to Lupujūs, Imagine Nation Brewing Company’s explosion of hop aroma and flavor. 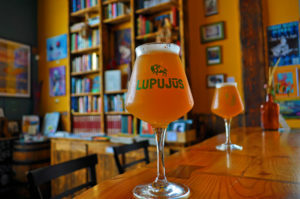 Lupujūs is not so much a beer as a series of hop experiments, each seeking to create a beer with an unmistakable juiciness to it, known as a New England (or Northeast) style IPA. Lupujūs 8 at Imagine Nation Brewing Co.
To name the series, Imagine Nation borrows from the Trappist tradition where the number in the name of the beer, like a Rochefort 10, roughly corresponds to the amount of alcohol. Thus, Lupujūs 5 is Imagine Nation’s session IPA at around 5 % alcohol by volume. Lupujūs 6 is a Northeast strong pale ale at 6%, the Lupujūs 7 is an IPA and the Lupujūs 8 is a double IPA. All are created based on the same family of New England-style IPAs that Rivers has been perfecting. The hops change from batch to batch, but always include those with big tropical fruit and citrus flavors and aroma – hops like Citra, Mosaic, Eldorado, Azacca, Galaxy and Nelson Sauvin. “Basically all the southern hemisphere hops that nobody has access to, those are the great ones,” Rivers says with a laugh. Call them New England-style, Northeast-style, murky, cloudy, or hazy, they generally trace their evolution back to Heady Topper, the unpasteurized and unfiltered creation of The Alchemist brewery in Vermont. Rivers remembers the first time he tried one. Robert Rivers, brewer and co-owner of Imagine Nation, enjoys one of his Lupujūs creations. The balance Blackfoot created with its Single-Malt IPA was ahead of its time, shown by the broad transformation IPAs have undergone over the past few years from biting bitterness to a stronger focus on hop aroma and flavor. The shift has attracted a broader range of beer drinkers, something Imagine Nation is experiencing with Lupujūs in a dramatic way. How aggressively? Imagine Nation uses more than twice the amount of hops to brew a Lupujūs than used in their west coast style IPA, often using 12 to 14 pounds of hops for dry hopping in a seven bbl batch. Rivers dry hops the beers at multiple times during fermentation to let the yeast interact at different points in the process. Not surprisingly, the large amount of hops needed to brew Imagine Nation’s Lupujūs beers comes with added expense. Yet, Rivers acknowledges the cost is necessary to produce these smooth, juicy beers bursting with hop aroma and flavor. Adding all those hops can also come with a certain extra challenge. Rivers explains. “You’re dry hopping earlier, which can be frightening. As soon as you throw all the hops in, the CO2 starts to break out of the beer and it creates pressure in the tank and you have a very limited amount of time to get your cap back on and your tri-clamp secured to seal the tank so your pressure goes into your blow off bucket. When he’s not perched on top of a fermenter, Rivers is working on new ways to build off the success of the Lupujūs series, using only the four basic ingredients of beer, water, malt, hops and yeast. Beer geeks fawn over the darlings of the New England-style IPA, breweries like Massachusetts’ Trillium, and Vermont’s Fiddlehead and Hill Farmstead. 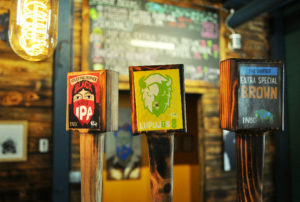 Could a Montana brewery compete with the finest brewers of New England-style IPAs? To find out, we turned to a blind taste test between Imagine Nation’s Lupujūs 8 and an 8% New England Style IPA from Tree House Brewing in Massachusetts. Tree House is the kind of place people make pilgrimages to. Where the beer is so popular, can and growler sales are limited to specific hours and often run out before the line dissipates. In other words, about as tough a test as Lupujūs might face. With furrowed brows, we dissected every aspect of the two beers over the course of a half an hour or so. The result? The Tree House and Lupujūs had nearly identical color, mouthfeel, explosive hop aroma and massive smooth hop flavor. Tree House won on appearance to style with a slightly murkier character. Lupujūs 8 won on overall juicy flavor, with Tree House receiving a couple of points deduction for a slight garlic/onion presence, which, we guessed, came from the use of Summit hops. Not a flaw, but just enough of a character to give the nod to Lupujūs. Both beers were excellent and proved a lesson learned time and again. Phenomenal beer can often be found right in your back yard. What Rivers and Krum created is Imagine Nation Brewing Company, the world’s first brewery to incorporate a community education center. The center is meant to be a house of dialogue, learning, and understanding, providing a space for people from all walks of life to find common ground for inspiring social change locally, in Missoula, Montana, and beyond. 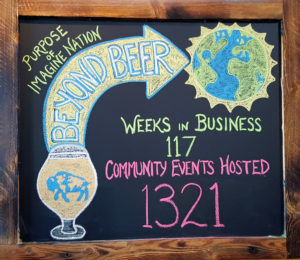 More than a brewery, Imagine Nation is a popular spot for community events. Is it working? 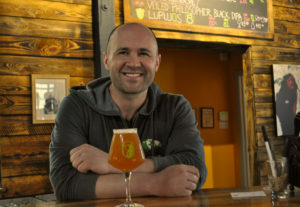 “I would say every time we have a taproom dialogue where we take on very controversial issues challenging to people, most recently on issues of race and identity in American, the tap room is elbow to elbow and completely silent and still with people paying attention to panelists and then people talking at their table together and connecting about the issues of our times,” says Rivers. When you go . . . .
You’ll find Imagine Nation Brewing Co. at 1151 W Broadway St, Missoula, MT, along the banks of the Clark Fork River. The brewery typically has one version of Lupujūs on at any given time and it’s anyone’s guess which version that will be. It also rotates quickly, thanks to its popularity. Enjoy the patio overlooking the river during the warmer months and don’t pass up Imagine Nation’s other popular beers, like the Freedom Fighter IPA, Na Fianna ESB, Luminous Folly Oatmeal Stout, and Veiled Philosopher Double Black IPA. You’ll find more about Imagine Nation at its website and facebook page. Thanks again for an interesting read. Did I overlook the part where you tried the beer and gave your thoughts? Certainly seems that I would want to try it for a new experience.